In the event you go through an audit and the IRS assesses more tax than you believe is correct, you have the right to appeal that case to an independent IRS appeals officer. That independent IRS tax appeals officer will take a new look at the case and make their own determination as to whether the tax court will agree with the assessment or not. When you are negotiating with a tax appeals officer, what is important is what you think could possibly happen in tax court down the road. It is important to show the tax appeals officer that you are ready willing and able to go to tax court and that you are not just a bunch of talk like a lot of young lawyers are, and that you can win the case in tax court. To best handle an IRS audit, it's imperative we organize all of your canceled checks, credit card statements, cash payments, as well as all of your business receipts for the audit in logical order. The presentation to the revenue agent must be planned well and a legitimate story must be well thought out and supported by documents. Most CPAs in, enrolled agents, and tax preparers just hand the revenue agent the documents, inviting disaster. It's imperative to resolve the case at the lowest level possible and at the least cost. We will negotiate the best result with the IRS auditor and take all disagreements to the group manager for resolution. If still unresolved, we can go to fast track mediation to obtain resolution before an IRS appeals officer. This would give you three chances during the audit process to obtain the lowest tax penalties and interest possible. If the auditor is still unagreed, we will timely petition your tax case to appeals for resolution before an IRS appeals officer. They are far more experienced, educated, and articulate, so the presentation must be well-supported by the Internal Revenue Code, regulations, and case law. In addition, we will obtain documents from third parties to support your case. The reason we get the best result before an IRS appeals officer is because the case is more well developed. We've had ample opportunity to obtain receipts, invoices, and documents from third parties, and obtain testimony from witnesses. We have a great reputation at the IRS appeals office of making excellent presentations, supported by admissible evidence and solid legal research. If still unagreed, we will petition the notice of deficiency to tax court. We'll meet with the IRS area counsel to discuss the audit, appeals, and negotiate a settlement, or submit a written qualified offer. Negotiating with area counsel is significantly different, as the IRS attorney's rely heavily on the federal rules of evidence, such as the hearsay rule, hearsay exceptions, competency, identification, relevancy, authenticity, and foundation. They also rely on the tax code rules such as the stipulation of facts and summary documents. We will protect all of your privileges, such as the attorney-client, and the attorney-work product privileges. We'll file all the relevant pretrial motions to gain an advantage during trial. Typical cases include substantiation cases, determination of income and expenses, collection due process appeals of liens and levys, and employee vs. independent contractor cases. I'm known as one of the most aggressive tax attorneys in Southern California in representing my client, defending my taxpayer's interests, and in getting the best results available. Please call me at 858-481-4844 for a confidential call that's protected by the attorney-client privilege. What Is The Chance Of Success With Tax Appeals? The chance of success with tax appeals is entirely dependent upon the amount of effort and energy that you put into the case. It is about how you present the case to the IRS. It's all about negotiations. You negotiate from the first phone call and it's all about the presentation that you make to the Internal Revenue Service. In order to have a strong chance of success with tax appeals you have to convince the revenue agent or appeals officer, through negotiation, that you have put together a strong case that can win in tax court. Therefore, your ability to demonstrate confidence in your case is paramount. What Is The Tax Appeal Process? The first step int he tax appeal process is to go through the audit. You develop your case to the greatest extent possible at the audit level. You provide the documents that you think are relevant and make a presentation at the audit level, knowing that the appeals officer is actually likely to be deciding the case down the road a ways. So, the documents that you give them and how you position your case is really all set up for the appeal because that is where you will get the best result. Then when you meet the appeals officer, you are giving the second type of tax appeal presentation. The appeals officer generally has more experience, they are more knowledgeable, they are more technically competent because they just have more experience in tax appeals. Then we negotiate with the tax appeals officer to get the best result possible. 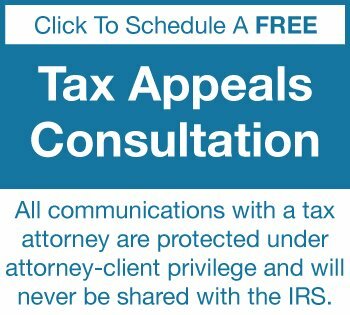 What Are The Risks Associated With An IRS Appeal? The only real risk is the cost of attorneys fees. That is really the only risk. You generally get a better result at the appeals level than you do at the revenue agent level because the revenue agent doesn't have the authority to decide on a close call or questionable case. Those have to be resolved at the appeals level, not at the revenue agent level. So, you generally get a better result from an appeals officer, knowing the hazards of litigation that the tax appeals officer will take into consideration, whereas the revenue agent at the audit level does not have the authority to take those things into consideration. Over the past 25+ years, we have had numerous cases go all the way to tax court and have been very successful in attaining the most favorable outcome possible. It is important to note that very few cases actually go to tax court because the expense is so great. It is nearly always more cost effective to resolve the case at the appeals level than it is through tax court. However, in order to get a good result at the appeals level, the tax appeals officer has to know that you are ready willing and able to go to tax court and fight it in order to get a favorable resolution. Otherwise you will just get pushed over by the appeals officer. They know your history and they know the history of the tax attorney that is representing you, which is why it is critically important to have a tax lawyer with a successful history in tax court. 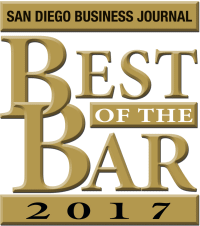 The Tax Lawyer, William D. Hartsock has been at every tax court calendar call since 2009 because he is the Chairman of the San Diego County Bar Association Pro Se Taxpayer Program. Mr. Hartsock over 100 of the individuals who would have lacked representation in tax court. This firm has taken many cases from audits, through appeals and into tax litigation. We are very familiar with the rules and regulations and we are very successful because the IRS agents know that we are ready willing and able to go to tax court. How Do Tax Appeals Cases Get Settled?